Burchetta is an antipasto from Italy that consists of grilled bread rubbed with garlic and topped with olive oil, salt and pepper. Veggie Burchetta recipe is actually a pizza recipe with Burchetta as base. This a very quick and flexible recipe that can be prepared with whatever is available at home without any pre-preparation. If ready made burchetta is not available near you, sourdough bread or even simple white or brown bread can also be used as a base. 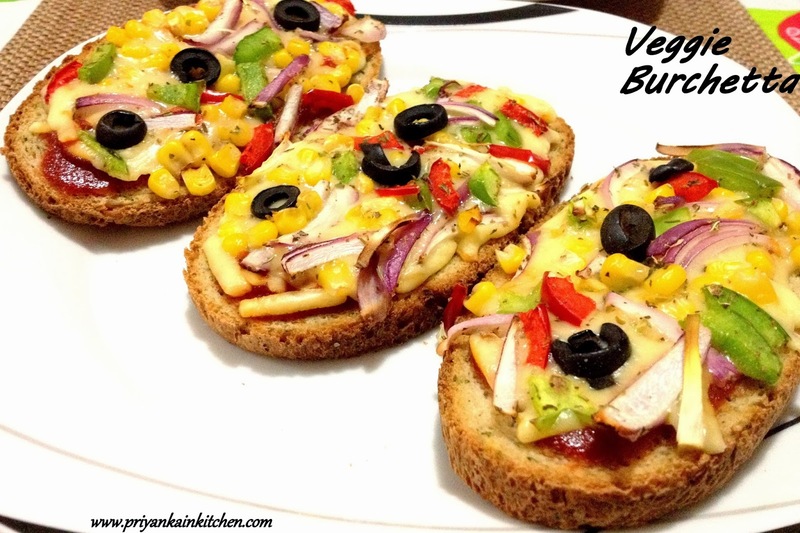 Veggie Burchetta is very tasty and quick anytime snack that can also be served as an appetizer. 1 bowl shredded mozzarella cheese. Apply a little butter on one side of all the slices. Place all the slices on a lined tray with buttered side facing upwards. Add mixed herbs to vegetables and mix well. Apply a layer of sauce on the slices above butter. Evenly cover all the slices with grated cheese. Finally place vegetables on all the slices. Bake for 10-15 mins or until cheese melts and golden spots start to appear. It is also good to press the vegetables once with spatula in between. It prevents them from falling down from the slices. Tip: If you are using a normal bread, then cut the slices into two triangles before serving.